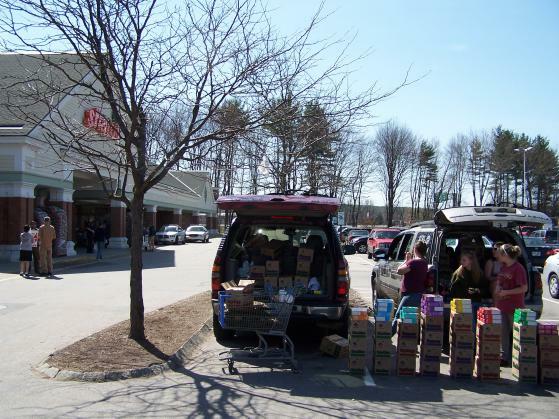 On April 3, the Keene police ordered protesters to leave the parking lot of a Shaw's supermarket in Keene under threat of arrest, but allowed Girl Scouts to keep selling cookies in the same parking lot. A spokesman for the UFCW union www.ufcw.org said his union and/or the ACLU might sue the city of Keene for violating the First Amendment to the U.S. Constitution. Before the police arrived, the protesters had about an hour to persuade shoppers to go elsewhere for their groceries. 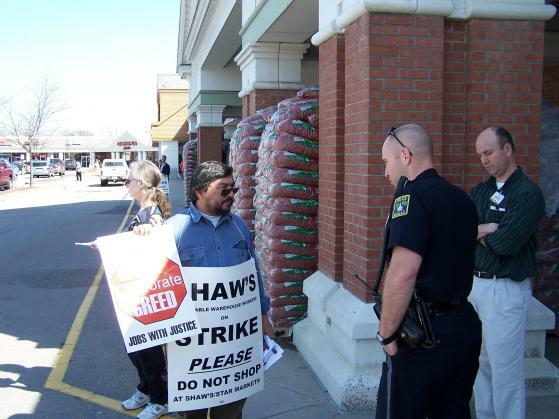 They appeared to be successful, with many shoppers saying they would go to the nearby Hannaford supermarket to show their support for the striking Shaw's workers. To enlarge the photos, please click on them, then scroll down and click "See full-size image." The Shaw's store manager is standing behind the policeman in the first photo. Submitted by Anonymous on Mon, 04/05/2010 - 16:50. I don't see why you're complaining about this? It's private property. The property owner or company that leases the property has the right to decide who can stand out on the sidewalk selling cookies, raffle tickets, etc. I've done it before with my kids and you have to get permissions. So, if the company (Shaw's in the case) doesn't want the picket line at the door they can ask you to move elsewhere. I know I will hear the argument that it's a constitutional right or free speech or right to assembly. Yes, you can still make yourself heard but if you were protesting from my front steps you can bet I would call the police and have you relocated to a less disruptive location. Submitted by Anonymous on Sat, 04/17/2010 - 13:53. As my understanding the term private property is very gray. This is a shopping plaza open to the public and doesn't have any posted private property signs there fore it's harder to enforce that it is private. The other problem here is that again this is a shopping plaza they're are a lot of stores in that lot. 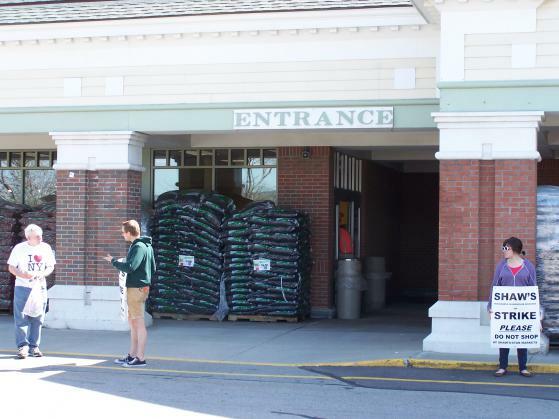 Does Shaws own the whole lot or are they leasing the space. If they are leasing then Shaws has no control outside the physical store and can not order people to leave the grounds. Submitted by Anonymous on Tue, 04/06/2010 - 06:45. Please note that, in general, the Valley Post only publishes comments that are signed with the author's real name, town, and state. Although not required, we also request that people submit their e-mail address and/or phone number with comments. We will not publish your contact info unless you ask us to. Re. the substance of your comment: the UFCW spokesman at the event in Keene, Jonathan Landsman, said there had been a recent federal court decision saying that if a company is going to ask police to arrest people for trespassing on its property while they are engaged in "concerted activity" (such as selling cookies or holding picket signs) the police cannot discriminate between groups. So Wal-Mart must allow union organizers to stand outside its stores if it allows Salvation Army Santa Claus bell-ringer fundraisers to do so. Submitted by Anonymous on Sun, 04/04/2010 - 09:05. The photograph of the store manager standing behind the policeman tells us whose rights are and aren't protected.